WHERE: 402 S. Howard Ave.
WHAT: An education in beer drinking. Even the most sophisticated craft brew aficionado will learn… and taste something new at WOB. The WOB menu offers over 500 beers and basically reads like a Beer Bible, describing each beer’s flavor and origin, explaining the brewing process, defining different beer types and offering suggestions for mixing drafts. WHEN (To Go): When your beer taste buds are feeling adventurous. Don’t even think about visiting WOB if you are in the mood for a Bud Light or one of its counterparts. WOB may offer over 500 different brews, but no, they don’t serve your standard Bud. 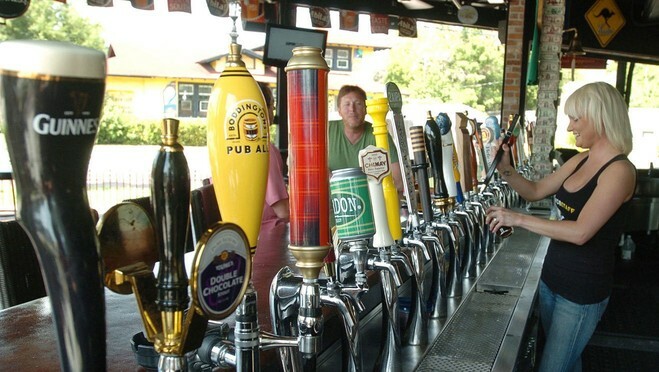 WHY: Because now you don’t have to leave South Tampa to visit a World of Beer location. When the first WOB opened in Westchase in 2007, we all swooned with delight over the bar’s concept but not the location. Now after watching a dozen other locations open in Tampa’s surrounding suburbs, we finally have our own in South Tampa. WHO (To Bring With You): The friend that likes beer and a challenge. WOB offers a Loyal Card Program wherein customers receive one point for every different beer they try. Earn 500 points and receive a $250 bar tab and WOB party in your honor. Earn 1,000 points, win a cruise!